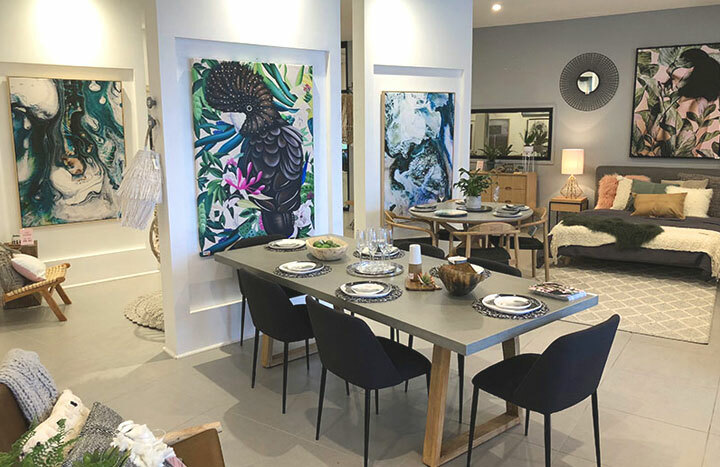 Interior designer and stylist Melissa Lunardon presents her 2018/2019 key trends that we will be seeing in the interior design world! • It sounds natural, but it’s best to start with small accessories, such as a terracotta planter or velvet cushion. 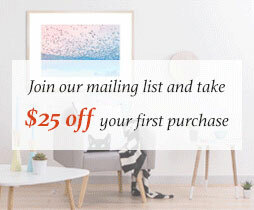 If you feel bold, then you can opt for a couch or even paint an entire wall! • The colours of the Terracotta range blend with grey, black, white, but also with natural materials such as wicker, rattan or wood. 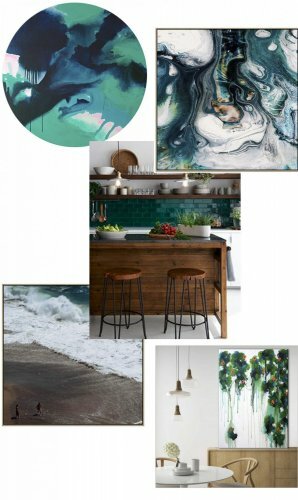 • Featured art (clock-wise): Beautiful Decay canvas print, Deadvlei canvas print, Comic canvas print, Desert Rogue canvas print and Tempt 1 canvas print. 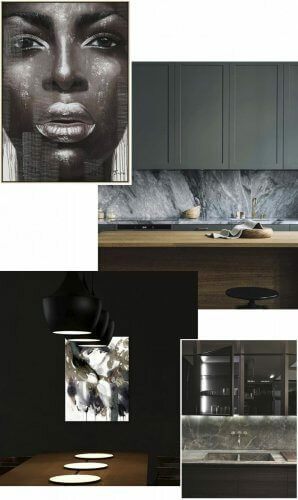 • There is a slight move away from the light oaks and bleached timbers we have seen recently with the Scandinavian look, but rich walnuts and darker stained timbers are making a comeback. • Furniture pieces and kitchen cabinetry with beautiful details can create a warm and moody interior. 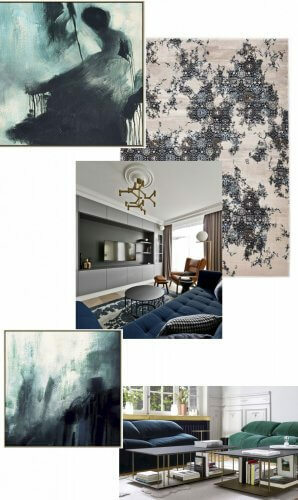 • Paired with deep blues and greens, it creates a visually calming vibe reminiscent of the colours you see outside in nature. 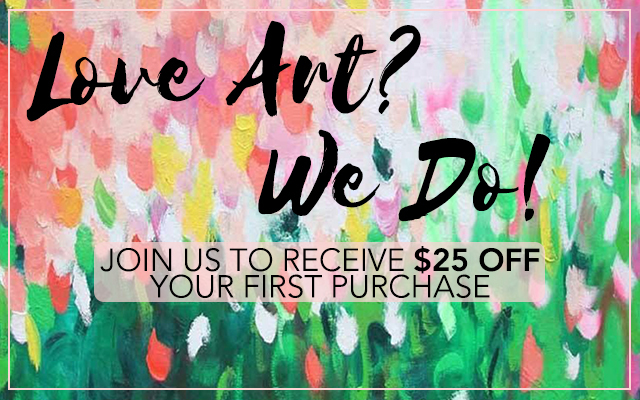 • Featured art (clock-wise): Augustana acrylic art, Static Forces canvas print, Harmony Spring hand painted art and Beach canvas print. • Modernism has been around for a very long time and for good reason – quality lasts a lifetime! • Mixing mid-century pieces with contemporary furniture items, create a timeless interior and easy to achieve with the help of Ikea! • Focus on simple and functional forms, and your colour palette can vary from bright hues (circa 1950s) to earthy colours (circa 1960s). 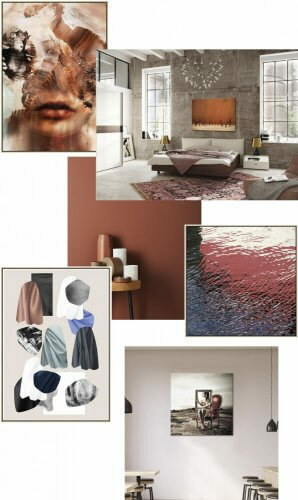 Red, olive, muted colours, pastels and neutrals can complete the look. 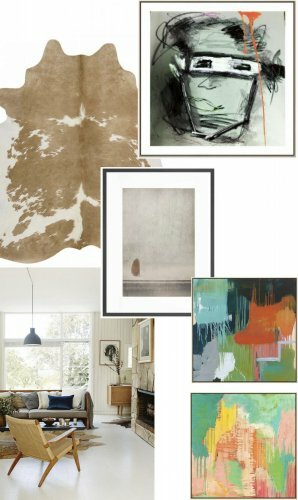 • Featured art (clock-wise): Cow Hide rug, Nowhere Man framed print, Solitude Stands by the Window framed print, Equilibrium hand painted art and Patches of Autumn hand painted art. • You have probably already seen an influx of terrazzo lately but this finish is one of my faves! Years ago, it was mostly used as flooring but the contemporary spin on this look has been to incorporate it within furniture, lighting, bench tops and furniture! • Add terrazzo touches to your kitchen and bathroom, and even in your decor. There is a plethora of terrazzo-look home accessories and decorative objects like trays, vases and cushions. • Featured art (clock-wise): Church House framed print, Test 1 round framed print and Under Velvet canvas print. • Natural stone benchtops are quite popular and are here to stay. We are seeing a slight move away from the white Calacatta marbles with darker tones coming through. • Thin bench tops, creating a minimal look are huge in Europe and will start to be more prevalent in Australia. • A rise in porcelain products used for kitchen bench tops, splash backs and bathroom walls. Porcelain is indestructible and slab sizes are huge, so minimal join lines! • Featured art (clock-wise): Tribal 1 hand painted art and The Bloomsong 2 hand painted art. • Accents in pine green and royal blues that mimic 20th-century palaces. 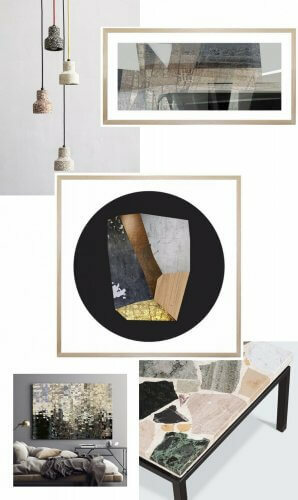 • Experiment with rich, inviting textures such as velvets, a mix of shiny surfaces such as mix metals like brass and gold. • Featured art (clock-wise): Rinascente Azzuro hand painted art, Heirloom rug and Ice and Shade hand painted art.